As per the latest reports, The Home Affairs Department will provide a permanent residence to the Retirement (Subclass 410) and Investor Retirement (Subclass 405) visa holders from Nov 17th, 2018. 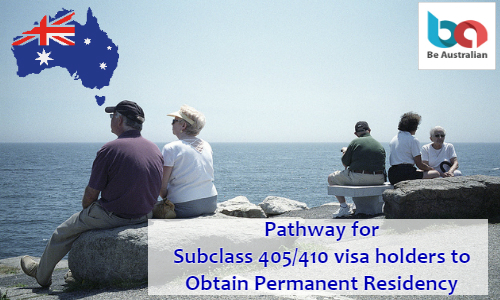 Subclass 405 and Subclass 410 visas are for the undependable retirees who are looking to stay in Australia during their retirement. These visas are applicable to the people who are 55 years or above with an average AUD$65,000 income per year. The legislative instrument starts a new pathway to permanent the status of Investor Retirement and Retirement visa holders of by issuing them with a pathway to get an Australian permanent visa. It was introduced long ago (more than 35 years ago) to support self-funding Retirees. This scheme helps to spend a long time in Australian countries at no cost as temporary residents. While these actions resulted in a temporary allowance of self-dependent Retirees, but this not for some Retirees especially since the worldwide financial crisis-related. While most of the Retirees are from nations with RHCA and the individuals who applied for visa after December 1st, 1998 are not eligible for the Medical care through the RHCA. The greater part of Retirees have stayed in Australian countries for a huge period without an entry for a perpetual visa. To meet the eligibility for PR visa, the candidate must be already a holder of Subclass 410 or Subclass 405 visa. Retirees should apply in Australia, keep up sufficient medical coverage until the visa is issued. The applicants also meet the significant well-being, character for issuing the visa. The actual reason for this change is a response identifying with worries about the issues faced by subclass 405 or subclass 410 visa holders including poor health and other community related services. The drawback in connection to taxes and property issues faced by 405 or 410 visa holders. Retirees have the opportunities to apply either for the Subclass 143 (Contributory Parent) visa or Subclass 103 (Parent) visa. They can also continue to live in Australia with just a temporary resident visa if they don't wish to apply for permanent residence. To apply for these visas, Retirees should have an allowance to a bridging visa which helps maintain lawful status during the parent visa application process. Home Affairs have announced that the following visas are obtainable under the non-contributory or contributory parent visa program. In the 2018–19 Migration Program, around 1 500 locations have been issued to subclass 103 and 804 visas and 7 175 locations have been assigned to subclass 884/864 and subclass 173/143 visas.